On 15th September 2014, Sri Krishna Jayanthi was celebrated at Anandadham (School is running by Vivekananda Kendra Vedic Vision Foundation) in a grand way, this year. Twenty three children participated. Out of them twenty one were dressed up as Krishnas and two of them as Radhas. From a few months old babies to six year old children all took part. From the morning there was a big crowd in the campus. All the parents and guardians of Sandeepani Sishuvihar had come to dress up their own wards. All were made to sit on the stage so that the judges could find out the best dressed, smart looking Krishna. He best among the little Krishnas was little Ananthakrishnan, one and a half years old, boy. 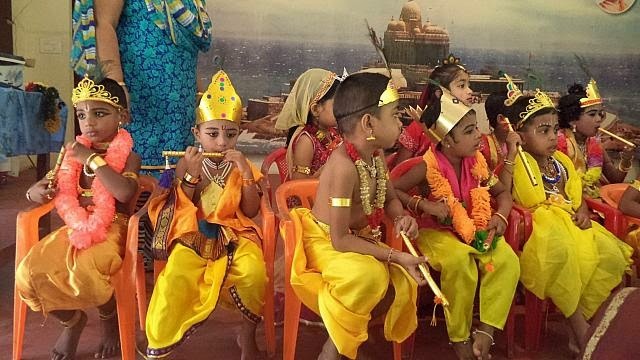 After that there were songs on Krishna, sung by the older children and ladies. All received prasadam after Uriadi programme which was the most interesting part enjoyed by all the children.